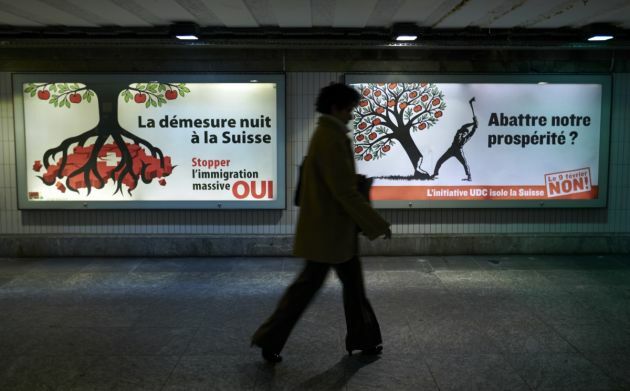 (Photo: REUTERS / Denis Balibouse)A woman walks past two immigration campaign posters in Lausanne February 4, 2014. With foreigners making up 23 percent of Switzerland's population of 8 million, the Swiss will vote on February 9 on a proposal to re-impose quotas on migrants from the European Union. The right-wing Swiss People's Party (SVP) wants Switzerland to seize back control over immigration by reintroducing quotas, renegotiating free movement of people with the EU, introduced in 2002 and asking employers to give national preference when filling jobs. GENEVA – The head of the Geneva-based World Council of Churches has warned that a Swiss referendum vote backing restrictions of immigration from the European Union could have "adverse effects" on international organizations. "We stand with our member churches here in Switzerland who have made it clear that Switzerland needs to continue being a place that welcomes the stranger," the WCC general secretary Rev. Olav Fykse Tveit said in a statement on Monday. The Federation of Swiss Protestant Churches said in a statement it regrets the acceptance by a narrow majority of the federal popular initiative "Against mass immigration." It called for an application of the law that respects international and human rights law and the free movement of people. "The Federation of Protestant Churches calls for the maintenance of family unification. Human rights, such as family life cannot be limited by a quota: these rights are universal and indivisible." The referendum held in Switzerland the previous day registered 50.3 percent of votes in favour of strict quotas for immigration, which can impact the Swiss-EU agreement on freedom of movement. It was a razor-thin number of 19,526 voters who backed the rightwing initiative going against the advice of the Swiss government, business and church leaders. Switzerland is not a member of the EU but it has adopted a number of EU policies including the Schengen visa system governing free movement of people through Europe. The WCC's Tveit said, "There are other potential ramifications to this vote that could adversely affect the WCC and other international organizations working in Geneva and throughout Switzerland. "We depend on the diversity of our staff and the gifts they bring to represent our global fellowship of churches. To be able to maintain this, we need to learn more from the Geneva and Swiss authorities about the impact of the law," he noted. The WCC is a grouping of churches representing more than 500 million Christians from Protestant, Orthodox, Anglican and other traditions in over 110 countries. More than 40 international organizations are based around Geneva, in the French-speaking part of Switzerland, which was one region that voted against the initiative. A plethora of United Nations organizations are based in Geneva and multi-national corporations are based in different parts of Switzerland, companies such as food giant Nestlé, drug makers Novartis and Roche and commodities companies like Glencore Xtrata and Louis Dreyfus Commodities. The move was put forward by the Swiss People's Party which is opposed to foreigners coming into the country and is opposed to ties with the EU. More than 20 percent of Swwitzerland's 8 million residents are foreigners. The yes vote means that Switzerland will have to renegotiate its bilateral accord with the EU on the free movement of people within three years or revoke it. This in turn could threaten other bilateral agreements with the 28-nation EU. The European Commission, the EU's executive body, said in a statement it regretted that the vote had passed. "This goes against the principle of the free movement of people between the European Union and Switzerland. The Union will examine the implications of this initiative on Swiss-EU relations as a whole," said the statement.